I love the fit of these fins and the comfort! This is my third pair of these fins. I scuba dive and I like the extra workout for my legs. They wear well. Practice will go swimmingly now! 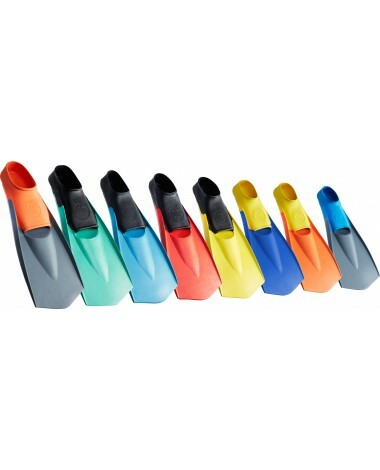 As someone who hates kicking, fins can be a fun addition to a workout. More importantly, they are great for warm-up by taking some pressure off the shoulders ... and add some nice diversity to any workout. Q: Do these fit narrow feet? Q: When will you get the large back in stock? A: Yes, Please check back 11/7 is the expected arrival date. Q: how much does the size medium weigh (per fin)? Q: my 10 year old daughter wears a woman's size 6.5. what size fin should I get her? A: Thank you for contacting TYR Sport! We are always eager to answer any questions you have about our products. Based off your daughters size in shoes a size Small should be correct. Designed with a Long Blade Length to increase leg strength and enhance foot flexibility, Flexfins™ are a perfect choice for swimmers at any level that are looking to increase power in the water.